Such a common sight around the village. The cow has been eating grass for a couple of hours, and is now having a rest...sitting down and chewing her cud [regurgitating the grass into her mouth and re-masticating it]. 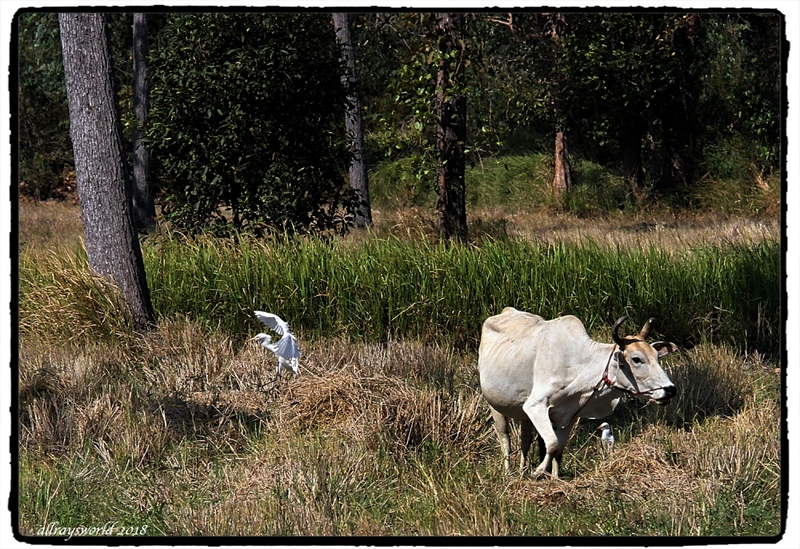 Her companion, the Little White Egret [aka Cattle Egret] is standing close by and waiting patiently for the cow to get on her feet again and eat some more grass...the cow will disturb insects, like grasshoppers, which the egret will plunder. This cow has a second companion, a White Vented Myna...it is sitting on the cow's shoulder, and will busy itself in looking for cow ticks and other tasty comestibles that live on the cow's skin or in her ears or even up her nose. Good companions to amuse each other during the long, monotonous day. Public mastication! What is SC coming to! Ray: Oooops! Sorry, Larry...perhaps I should have put a Warning flag on it for sensitive souls! good shot to demonstrate their symbiotic relationship, Ray. This is a seriously lovely thing to my eyes. Well photographed and explained Sir! Ray: I am delighted you think thusly, Chris. Ray: Je suis d'accord, Claudine ... Sapiens pourrait apprendre de l'étude de ce genre de choses. This is a sweet scene! We call this loyality or love. Ray: I see a lesson here for Sapiens, if only they were not blind, Philine. Ray: One of my favourite things around the village, Lisl. There's no doubt that you see nature in the raw now you are living in the countryside. Ray: We have lived in The Village for almost 3 years now, Brian, and are enjoying the lifestyle very much. My neighbour and I saw a cattle egret in the field beside me. They seem to land here every once in a while when blown off course. I couldn't believe my eyes twenty years ago. Ray: I get quite excited when I see a bird I haven't seen before, Mary...I'll be showing one here in a few days. All the species depending on each other; "I'll scratch your back if you scratch mine". Ray: There is no animosity in the relationships either, Alan. Awe - that's sweet!! Nice shots!